Even within the long-ago memories or recollections of boxing historians and fans of famous prizefighters, the name Jess Willard has almost fallen victim to near insignificance. 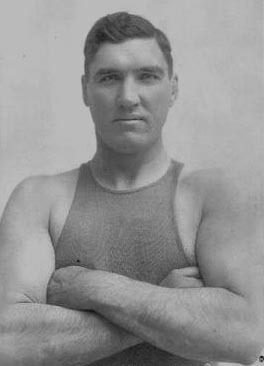 Jess Willard, the one-time heavyweight boxing champion of the world, and who alone earned the title, "The Great White Hope", has faded from memory, compared to his predecessor Jack Johnson, and his rival, Jack Dempsey. One wonders if historians have all the facts, considering that a little thing like Jess Willard's incorrect date of birth curiously never seems to get corrected. Jess Willard was born December 29, 1881 (not 1883) in St. Clere, Kansas. He was the youngest of four brothers born to Myron and Margaret Willard. Willard's father died in October of 1881, at age 37 from wounds received in the Civil War. Jess' mother remarried in 1891 to a man named Elisha Stalker, who had children from a previous marriage. As Jess, his older brothers and stop brothers grew up on Mr. Stalker's ranch, the chores of the boys was as normal and customary as most of farm people. Jess got along with his brothers and step-brothers, but never liked going to school. It should be noted that Willard's first love was horses, and from his teens to adulthood, got work on ranches working with horses. Because Jess Willard was an unusually large man -- even in his teens (his brothers were of normal stature) -- he found that he was not suitable to become a cowboy. So, he did the next best thing: He broke and trained horses, sometimes obtaining the horses from the Pottawotamie Indians, and selling them to ranchers or the cowboys themselves. Jess Willard grew up in the same area as the young girl he would someday marry. Her name was Harriet Evans, but is historically known as "Hattie". She was born in 1885. Jess and Hattie were married on March 13, 1908 in Leavenworth, Kansas. For employment, Jess worked in the livery stable business. He and Hattie moved all over the Midwest for Jess' line of work, landing in Oklahoma and Texas. It was also reported that he almost got work as a policeman in Oklahoma City. There is no positive story as to how Jess got into boxing, but it probably started in December 1910, in Oklahoma City. While hanging around the Union Athletic Club, he saw his very first staged bout. It was December 30, 1910, between two welterweights, Harry Brewer and Clarence English. Jess Willard's first exhibition bouts were in 1911; and so insignificant were they, that names of the opponents were not even recorded. Jess lost his first exhibition bout in the 3rd round, but won his 2nd bout in the 6th. The first known recorded exhibition bout of Willard's was on February 8, 1911. It was a 4-round bout with Billy Evart; and another exhibition on the same day, with Frank Mayo for 5 rounds. Jess Willard's actual and very first fight was with Louis Fink, which was staged February 15, 1911, in Sapulpa, Oklahoma. Willard lost by a foul in the 10th round. Thereafter, Willard fought in at least 20 other bouts and exhibitions in 1911. On Victor McLaglen in Springfield, Missouri. Victor McLaglen became a well-known film actor of the 1930s and ‘40s, and who was known for his roles with John Wayne. In 1912 Willard had 13 bouts and exhibitions. In 1913 he fought 13 more bouts, the most noted being with "Gunboat" Smith, and "Bull" Young, who died as a result of Willard's punches. From 1908, the world of heavyweight boxing and all of the U.S., was looking for someone to take the championship away from Jack Johnson, the black Heavyweight who became Champion that year. Racism was strong enough in the U.S. back then; and being a black athlete, and a black champion at anything, was very unpopular. So, the boxing world was looking for someone to put Jack Johnson -- this black man -- to the mat, and "bring the championship back to the white race." Jack Johnson's boxing style was not the subject of "sluggers", but of "speed." The question was, who could beat him. No white heavyweight fighter of that era seemed to earn the respect and marks of someone who could do the job. Not even Jim Jeffries, who came out of retirement in 1910 to try, but failed. A catch phrase arose, "A Great White Hope". What white hope was there who could beat Jack Johnson. That "white hope" became Jess Willard. With Jack Johnson was on the run throughout the U.S. and South America for evading prosecution of "importation of women for prostitution", promoters finally arranged a site for a Willard-Johnson championship bout, first Juarez, Mexico, and then finally Havana, Cuba. Willard fought only 3 bouts in 1914. In the meantime, Willard was cast in a 1-reel short film, "The Heart Punch". It was made in late 1914, but not released until February of 1915. As the record already shows it, Willard beat Johnson in 26 rounds of a scheduled 45-round bout, in simmering 100 degree plus humid temperatures of Havana. After the Johnson fight, Willard only boxed 4 other fights -- all exhibitions. Suddenly, Jess Willard was very popular -- in the world of boxing, of course, for bringing back the championship to the "white race," and in the U.S. lucrative offers abounded -- the movies, the stage. Willard did a stint in vaudeville at Hammersteins' Victoria Theatre in New York, but the biggest deal was with Buffalo Bill's Wild West Show, and later the 101 Ranch Wild West Show, which he owned and operated from 1916-1918. In 1916, Willard fought 6 times, one with Frank Moran. There were probably countless exhibitions in 1917, while with the 101 Ranch Wild West Show; and 4 recorded bouts in 1918. In 1919, just before Willard took on Jack Dempsey, he made a 7-reel feature film, "The Challenge of Chance," the only feature film he ever starred in. The 24 year-old Dempsey beat Willard over three rounds -- one of the most controversial bouts in history. No one can know for sure now, but photos of Willard's bruised body on one side only, plus the logic of a man going to the mat several times in the firstt round, but not again thereafter -- hints of something very suspicious in the fairness of that bout. Jess Willard retired from the ring . . . sort of. He fought in a half dozen exhibition bouts in 1922 in Los Angeles and San Francisco, California; and in 1923 made two attempts to make a comeback by fighting Floyd Johnson, TKOing Johnson in the 11th round. The last was in the same year, losing to Luis Firpo in the 8th round. Jess and Hattie had 5 children -- 3 girls and 2 boys. The first, Zella, was born in 1909. She was followed by another daughter, Frances, born inn 1911. Their first son, Jess Jr., was born in 1913, followed by another daughter, Enid, in 1914, and then a son, Alan, in 1916. Willard sold his Lawrence, Kansas ranch house in 1921 and moved employment for himself. One was in real-estate. Another was owning the first ranch market, which was in Hollywood, on the corner of Vine and Afton. Jess Willard also earned his livelihood refereeing wrestling matches, which he tolerated, and disclosed of his firsthand knowledge of its fakery. In 1933 he appeared in a bit part in a boxing movie, "The Prizefighter and the Lady", with Max Baer and Myrna Loy. Willard did some work overseas with the USO during WWII, but for the most part was a retired citizen. All but one of his children were married by the mid 1940s, and he had 6 grandchildren by 1953. Jess and Hattie lived in a couple of homes in the Los Angeles and Glendale areas before moving to their last house in the San Fernando Valley. Jess Willard lived to the age of almost 87, when he died on December 15, 1968. -Some sources report "San Francisco, Ca"